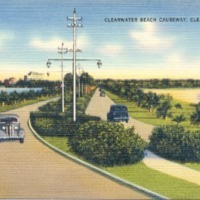 A postcard depicting the Clearwater Beach Causeway, now known as the Clearwater Memorial Causeway, in Clearwater, Florida. The road connects Downtown Clearwater with Clearwater Beach, carrying Florida State Road 60 (SR 60). Originally a two-lane road, the bridge was first constructed in the 1920s. That original causeway was later replaced by a new bridge in the 1950s. Construction for the new Clearwater Memorial Causeway began in 2001 and the bridge opened in 2005. Original 9 x 14 centimeter color postcard by Burgert Bros. and Tichnor Quality Views: Private Collection of Bob Van Horn. Digital reproduction of original 9 x 14 centimeter color postcard by Burgert Bros. and Tichnor Quality Views. Clearwater Collection, Pinellas County Collection, RICHES of Central Florida. Originally created by Burgert Bros. and Tichnor Quality Views, and published by Hillsboro News Company. "Clearwater Memorial Causeway, Clearwater." DrawBridgeAhead.com. http://www.drawbridgeahead.com/clwmemorialcswy.html. Burgert Bros. and Tichnor Quality Views. “Clearwater Beach Causeway Postcard.” RICHES of Central Florida accessed April 22, 2019, https://richesmi.cah.ucf.edu/omeka/items/show/7551.